Because I live under a rock, it’s only recently that I started paying attention to the buzz about Hamilton. For this reason, it’s unlikely that I’ll get tickets to see it in person until I’m around 102 years old, but it did remind me how much I love musicals. When I was young, my parents took me to see Cats on Broadway. I sat there in the tiny theater, mesmerized as the actors swayed and strutted and danced through the aisles, fascinated by the costumes and make-up and the fact that no one fell off of the tiny stage. Dad fell asleep during the first act, as in actually started snoring. I confronted him during intermission. Still, I think they’d concede it was better than my Annie phase. Sorry, guys. To this day even I can’t hear “It’s a Hard Knock Life” without breaking into hives. I actually remember the first time I joined in a standing ovation for set design: when the bridge shifted to a barricade in Les Miserables. Coincidentally that’s also when I learned blurting out, “WOW, THAT. IS. AWESOME!” during a theatrical production is generally frowned upon BY PEOPLE WITH NO SENSE OF WONDER. Another doomed relationship, although I will admit he was a good sport about it (and didn’t fall asleep). 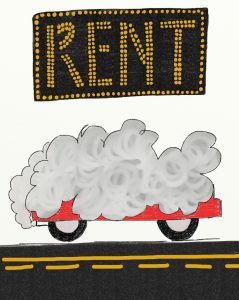 When Rent came to Miami I couldn’t wait to see it. People had been talking it up for AGES. I showed up late to the theater, and fortunately knew enough to realize if I didn’t make it inside in time for the curtain, I’d be stuck in the lobby. At least I thought that was how it worked. Maybe they’d make me go in and walk to the front of the theater and turn and face the whole audience and apologize, like that time I was late to biology. Not that that incident scarred me or anything. Forever. Suddenly panicked, I screeched to a stop in front of the theater, tossed the keys to the valet and sprinted inside, making it to my seat with barely seconds to spare. I expected to love Rent – and there were certainly great numbers in there – but it never did manage to grab me the way, say, Chess did. Or Miss Saigon. Or A Chorus Line. Or even Pippen. I can’t explain it to this day. Everyone I knew loved Rent. 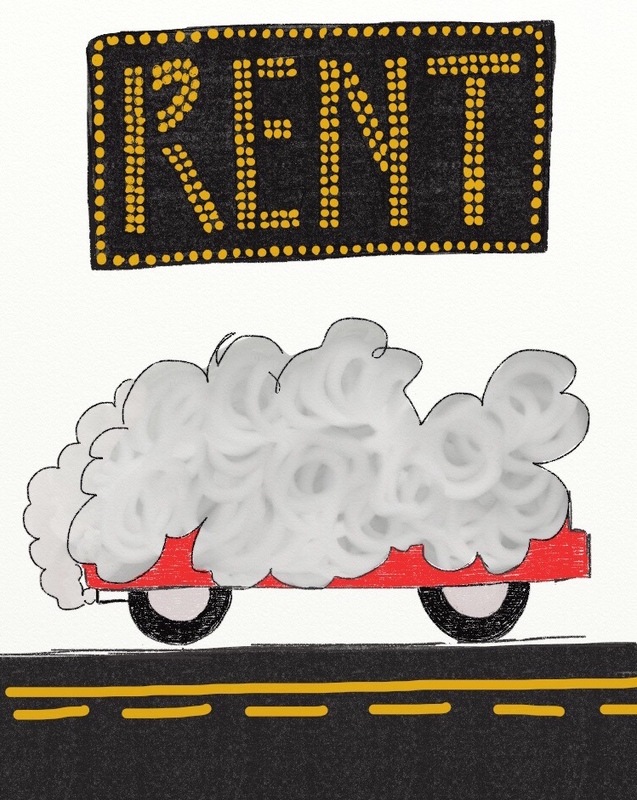 How could I not like Rent? Clearly there was something (new) tragically wrong with me. Distracted, I walked out of the theater after the show ended and distracted, I handed my keys to the valet and stood there, surrounded by the kind of people who use valet as a matter of course and not because they are running late and have no alternative. One by one the glittering, polished couples swept forward to enter their spotless, shiny cars. A Jaguar. A Porsche something-that-I-don’t-know-what-it’s-called. A Rolls Royce. A spaceship (possibly the one from Cats). The QE2. Then what sounded like Chitty-Chitty Bang-Bang’s emphysemic little brother approached. A wave of murmurs began as necks stretched to investigate. One woman pulled out a pair of opera glasses and squinted through them, trying to get a closer look. Around the corner lurched my Nissan Sentra. The paint was completely worn off the top, shading from grey white to pink to deep red like an enormous mechanical crustacean that crawled from the sea and boiled through in the south Florida sunshine. The glue for the inside roof lining was no match for the intense tropical humidity and it drooped down in festive swaths, giving the entire vehicle the mysterious yet questionably-legal appearance of an opium den on wheels. Two of the windows slid halfway open and the gearshift slipped, pitching the valet’s sternum directly into the steering column and turning his face light green. A shocked silence fell across the crowd as this ghost of an automobile pitched to a wobbly stop directly in front of me. I gazed casually at the horizon, ignoring countless horrified looks and trying not to inhale the cloud of black smoke wafting from the tailpipe. I strode to the driver’s side door and slid into the seat, a graceful move marred only slightly by my hair catching on the fabric dangling from the ceiling. I put the car into gear, stuck my arm through the conveniently open window and gave a regal wave, puttering off into the sunset accompanied by additional billows of exhaust and the whisper of dozens of jaws dropping open simultaneously. As you can imagine, after that I REALLY didn’t like Rent, although I’ll be the first to concede that’s not entirely fair. Too bad. Life’s not fair, Rent. That’s just the way it goes. We took my 98 year-old grandmother to see The Lion King when it came to town a couple of years ago. Despite her questionable hearing she loved every second, especially the complex costumes and masterful puppetry. She also loved Spamalot, although I’m a thousand percent certain she had no idea what it was about. A few years ago I discovered community-based musical theater. Yes, world, I discovered it personally. You’re welcome. Look, I already admitted that I live under a rock. A friend starred in Music Man, which I’d never seen. My mom and I went and it. Was. Amazing. The costumes, the sets, the music, the singing – all spectacular. AND it was VERY reasonably priced. AND THERE WAS NO VALET. In a burst of sheerest coincidence, this same friend is starring in another musical that opens tonight – White Christmas. So if you’re local and looking to do something a little different, I can’t think of a better option than attending the show (which runs through July 9th). If you’re not local, I’d urge you to see what your local community theater has going on. But take my advice – get there early, don’t yell out “WOW, THAT’S AWESOME!” in the middle of the performance no matter HOW good the sets, the costumes or the performances are, and wait until you’re well on your way home in your rickety Nissan Sentra to start singing the songs at the top of your lungs. I truly have no idea how adults the world over endured the Annie soundtrack. I mean, there was very little nuance – as you said, it was all about planting your feet and belting it out, preferably someplace that echoed. How we avoided a mass extinction event, I have no idea. Thanks so much for dropping by – that’s great that you know Dave, too! The world is small in very cool ways, isn’t it? And Shannon, I cannot WAIT to see Hamilton. And you make me feel rather vindicated in my blanket disinterest (ie: loathing) for Rent, for which I thank you. Cheers! So, little known fact. When I was 11 years old, I played the Fairy Godmother in Cinderella. It was a school musical put on at the private school I attended (yes, I can be posh when I want to be!! ), and I spent hours with my mum making my costume. We had to find just the right hula hoop to put through the hem of my dress, so it would look like it was floating. And tinfoil wand and star, for the “just glowy enough” magic tool. I’ve loved musicals since seeing Doris Day play Calamity Jane way back in the day. Seen Mama Mia, Rocky Horror, Rock of Ages (which was AWESOME!!) and next up is Evil Dead: The Musical. I LOVE THIS IMAGE SO HARD: Danny as fairy godmother. I mean, can you say freaking perfect?! And I tend not to judge in terms of classical versus non-classical (as you’ve surely realized by now). Which leaves me to say I am DEEPLY interested in Evil Dead: The Musical. Do we think they’ll have a song called, “Who Dares Disturb My Ancient Slumber”? I played the seventy-fifth reindeer the year we had the little Christmas play mix-up I mentioned here previously, and delivered a show-stopping performance as Wife of Hurdy Gurdy Man in Inherit the Wind. OH HELLO RESUME. Always loved the theater, rarely have someone to go with, unless it’s a gospel play. Also please put warning signs of how funny your writing is for those of us prone to cough-laughing fits. Tinu, you are welcome to join us anytime! I think you underestimate your Gran. Love you and loved the blog! I would NEVER underestimate Gran. Except maybe every once in a while for humorous purposes. I noticed that you didn’t refute my assessment of Dad’s behavior in Cats, though. Thanks and love you, too! Thanks, Maryetta! So great to hear from you and appreciate you reading and commenting – hooray!